Luxair's previous logo used from 21 October 1961 to 20 December 2003. Luxair's first aircraft was this Fokker F27 Friendship, pictured here in 1966. Descended from Luxembourg Airlines, founded in 1948, Luxair was starting to be set up in 1961 to meet the growing demand for air links between Luxembourg and other European cities. In 1962, Luxembourg Airlines became Luxair and began flights by launching a Luxembourg–Paris route with a Fokker F27 Friendship. From 1964 to 1969, Luxair operated three Lockheed L-1649A Starliner aircraft in a co-operative agreement with Trek Airways, from Luxembourg to Johannesburg. 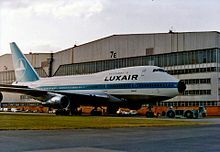 The Starliners were painted in Luxair livery and were registered in Luxembourg. By 1967, Luxair's fleet consisted of three Fokker F27 Friendships and one Vickers Viscount. The latter was written off in a non-fatal accident in 1969 and replaced the following year by the airline's first jet airliner, a Sud Aviation Caravelle. The first Boeing aircraft, a 737–200, joined the fleet in 1977. Over the years, Luxair gradually introduced further jet aircraft: Boeing 747SPs (for routes to South Africa), Boeing 737–400s and Boeing 737–500s; as well as Fokker 50 turboprops and Embraer jets. In March 2003, Luxair ordered two new Boeing 737–700s to replace its older Boeing aircraft. The first of the new aircraft was delivered on 18 February 2004. A third aircraft was ordered in August 2003 and delivered in January 2005. Later, at the same time during that same year, a new logo was launched on 21 December 2003. This time, the 42-year-old paperfly-logo is confined to history after 42 years, and by that, it gets replaced by something else new that will become a flying boomerang that symbolizes a new visual identity. In an effort to move to an all-jet fleet, the last Fokker 50 aircraft was withdrawn from service in April 2005. The rising cost of oil made operating regional jets increasingly difficult. To lessen its exposure, Luxair decided to reintroduce turboprop aircraft, and in June 2006 it signed a firm order with Bombardier Aerospace for three Dash 8-Q400s, plus three options. The last of the three aircraft was delivered in September 2007. Two additional Q400s were ordered later. In October 2008, Luxair decided to place an order for its first Boeing 737–800. This aircraft replaced the last Boeing 737–500 in Luxair's fleet and facilitated Luxair's offer on its holiday destinations. In 2009, the airline was awarded as the most punctual scheduled operator at London City Airport during 2008 by Flight on Time, based on CAA statistics. In 2011 Luxair carried 1,302,771 passengers. In 2013 and 2014, two new Boeing 737-800s fitted with the brand new Boeing Sky Interior became part of the fleet, which enabled Luxair to retire the last Boeing 737-500 from service. In July 2015, Luxair's minority shareholder Lufthansa announced it would sell its 13 percent stake in the airline that it had held since 1993. The government of Luxembourg was named as the preferred buyer. In November 2015, the sale was finalized when Lufthansa sold its entire stake to the state of Luxembourg. Luxair also announced it would stop flying its route to Frankfurt Airport previously operated on a codeshare with Lufthansa as the latter started the same route itself. Luxair is still part of the Lufthansa frequent flyer program Miles & More. As of November 2015, after Lufthansa sold its shares, the airline is owned by the State of Luxembourg (52.04%), Banque et Caisse d'Épargne de l'État (21.81%), Banque Internationale à Luxembourg (13.14%), the Luxair Group and others (13.11%). In total, the State of Luxembourg owns 74.98% of the company through various state-owned corporations and through its holding of 10% of Banque Internationale à Luxembourg. On 22 December 1969, a Vickers Viscount (registration LX-LGC) arriving from Frankfurt Airport, Germany,landed 60% on the right hand side of R24, hit a snowbank piled up by snowplows at the intersection with runway 20 during landing and rollout at Luxembourg Findel Airport in freezing fog weather. No passengers were killed, but the aircraft was damaged beyond repair. It was scrapped in May 1970. On 6 November 2002, Luxair Flight 9642, a Fokker 50 (registration LX-LGB) incoming from Berlin, Germany, crashed in a field near the village of Niederanven during its final approach to Luxembourg Findel Airport. Twenty passengers and two crew-members died, including artist Michel Majerus. Only the pilot in command and one passenger survived. This is the only fatal accident in Luxair's history. On 30 September 2015, Luxair Flight 9562, operated by a Bombardier Q400, was taking off from Saarbrücken Airport when the first officer retracted the landing gear prior to the aircraft lifting off. The aircraft collapsed onto its belly and came to a stop on the runway. The aircraft was damaged beyond repair and Luxair ordered a replacement Q400 to be delivered in August 2016. ^ "Legal Archived 2015-04-03 at the Wayback Machine." Luxair. Retrieved on 7 February 2011. "Luxair S.A. LuxairGroup Luxembourg Airport L-2987 Luxembourg." ^ "Directory: World Airlines". Flight International. 2007-04-03. p. 108. ^ "FLIGHTONTIME.info - 2008 Awards". Archived from the original on 3 April 2015. Retrieved 24 April 2015. ^ "LuxairGroup - Corporate Site". Archived from the original on 14 April 2015. Retrieved 24 April 2015. ^ "Lufthansa agreement breach: Luxair to stop Frankfurt flights but expand to Munich". Wort.lu. 2015-08-08. Archived from the original on 2017-12-01. Retrieved 2017-11-27. ^ "Miles & More - Luxair.lu". Luxair.lu. Archived from the original on 2017-12-28. Retrieved 2017-11-27. ^ The State of Luxembourg directly owns 26.85%; a further 21.81% is controlled by fully state-owned Banque et Caisse d’Epargne de l’Etat. "About Luxair Group – Shareholders". www.luxairgroup.lu. Luxair Group. Archived from the original on 3 April 2015. Retrieved 2 July 2015. ^ a b "Financial Report 2010". Archived from the original on 2012-11-15. Retrieved 6 December 2012. ^ "Annual Report 2011". Archived from the original on 2013-05-01. Retrieved 6 December 2012. ^ "Annual Report 2012". Archived from the original on 2013-05-01. Retrieved 1 June 2012. ^ "Annual Report 2013". Archived from the original on 2015-04-03. Retrieved 8 February 2015. ^ "Annual Report 2014". Archived from the original on 2016-03-04. Retrieved 11 December 2015. ^ "Annual Report 2015" (PDF). Archived (PDF) from the original on 2018-01-12. Retrieved 15 August 2017. ^ "Annual Report 2016" (PDF). Archived (PDF) from the original on 2017-06-29. Retrieved 15 August 2017. ^ "Profile on Luxair". CAPA. Centre for Aviation. Archived from the original on 2016-10-30. Retrieved 2016-10-30. ^ "Luxair to acquire two used B737-700s". Ch-Aviation. 7 August 2018. ^ "Adria to wet-lease CRJ700 to Luxair". EX-YU Aviation News. Archived from the original on 2017-10-27. ^ a b c d "World Airlines 1970 - Flight Archive". Archived from the original on 22 August 2016. Retrieved 27 July 2016. ^ FOCUS Online (24 April 2015). "Airline-Sicherheit - Fliegen - Reisen". FOCUS Online. Retrieved 24 April 2015. ^ "Luxair-Maschinn brécht Start of a kënnt um Bauch un d'Halen" (in Luxembourgish). RTL Télé Lëtzebuerg. Archived from the original on 1 October 2015. Retrieved 30 September 2015. Cargolux, legally Cargolux Airlines International S.A., is a Luxembourgish cargo airline with its headquarters and hub at Luxembourg Airport. With a global network, it is one of the largest scheduled all-cargo airlines in Europe. Charter flights and third party maintenance are also operated. Air Moldova is the national airline of Moldova headquartered in Chișinău. It mainly operates scheduled and charter services to destinations within Europe from its base at Chișinău International Airport. Luxembourg Airport is the main airport in Luxembourg. Previously called Luxembourg Findel Airport due to its location at Findel, it is Luxembourg's only international airport and is the only airport in the country with a paved runway. It is located 3.25 NM east of Luxembourg City. In 2018, it handled 4.04 million passengers. By cargo tonnage, LUX/ELLX ranked as Europe's fifth-busiest and the world's 28th-busiest in 2010. Luxair, Luxembourg's international airline, and cargo airline Cargolux have their head offices on the airport property. Avianca El Salvador, formerly Transportes Aereos del Continente Americano,, is an airline owned by the Synergy Group based in El Salvador. As TACA, it was the flag carrier of El Salvador. As Avianca El Salvador, it is one of the seven nationally branded airlines in the Avianca Holdings group of Latin American airlines. This Airline has been in operation for 75 years. Privatair SA was a Swiss airline headquartered in Meyrin, which operated business jets as well as scheduled services on behalf of major airlines. In addition the company operated crew and pilot training facilities. PrivatAir SA was a registered air carrier with two air operator's certificates in Switzerland and through its subsidiary PrivatAir GmbH in Germany. On 5 December 2018, PrivatAir filed for insolvency and ceased operations. Austrian Airlines AG, sometimes shortened to Austrian, is the flag carrier of Austria and a subsidiary of the Lufthansa Group. The airline is headquartered on the grounds of Vienna International Airport in Schwechat where it also maintains its hub. It flies to six domestic and more than 120 international year-round and seasonal destinations in 55 countries as of July 2016, and is a member of the Star Alliance.